We started “day 2” of the 10-day Real Food Pledge with oatmeal. Patrick already eats oatmeal for breakfast most days. We like to make the “old fashioned” oats in a 1-to-1 oats to milk ratio, microwaved for one minute. We add cinnamon and either bananas or apple chunks, and it’s delicious. Patrick had a great lunch picnic with his buddies and scarfed down a surprising amount of all of that food! While Patrick napped, I enjoyed unsweetened coffee and started a pot of Bev Balhoff’s Easy Red Beans. 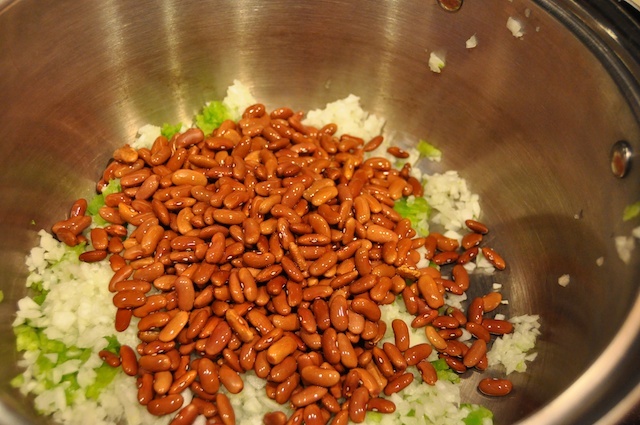 It is Monday, and as the Louisiana tradition dictates… laundry and red beans on Monday! When Patrick woke up, we had a snack of hard-boiled, local free-range eggs and NC apple slices. He ate two eggs and wanted more. I didn’t know he liked hard-boiled eggs! The pot of red beans simmered for several hours and was ready just in time for dinner. I forgot to get non-factory-farm ham to season my beans, so our dinner was unintentionally vegetarian. I boiled brown rice to go with the red beans. We like regular, dry brown rice much better than the quick, parboiled brown rice. The texture difference is worth 30 minutes to make it. After I ran tonight, I needed another snack, so I “created” chocolate yogurt. 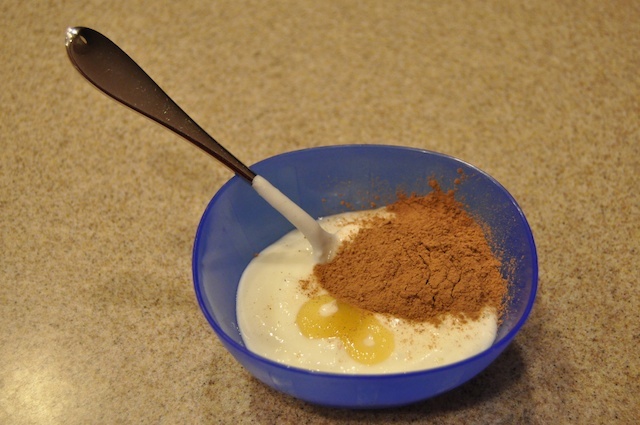 I mixed cocoa and a little honey into plain, unsweetened yogurt. Delicious! Also, we have oatmeal most mornings, too, and in addition to cinnamon and fruit, love to add some chopped walnuts for protein.